pdf2htmlEX Win32 static version, compiled with mxe under Ubuntu. In one word, pdf2htmlEX is a tool that Convert PDF to HTML without losing text or format, bases on poppler, FontForge , and jQuery. support windows temp directory, tested under windows 64-bit system(tried all the example offered by the author, all successful). pdf2htmlEX renders PDF files in HTML, utilizing modern Web technologies. It aims to provide an accurate rendering, while keeping optimized for Web display. GPLv3 with additional terms for most parts, MIT License for share/*(in Windows version, I change the name of share to data). I just did some modification and compiled for windows, the modified source is here . 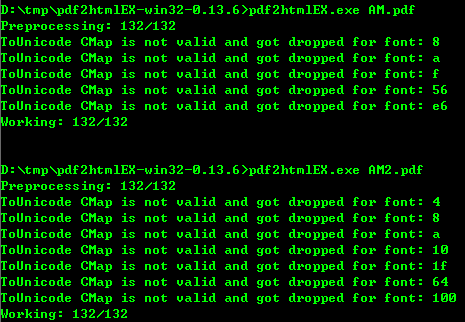 121 Responses to "pdf2htmlEX Windows Version"
I am not sure which version you use, I just tested with pdf2htmlEX-0.12(not release because of fontforge bug), it works fine, so I share with you, it has some wired debug info, just ignore it. hi, I downloaded the version 0.12 in Windows 7, most PDF files converted fine, thanks! But, some special Chinese PDF files, such as this one: http://www.bimlib.cn/App/Upload/doc/2014-11-17/5469b39bbe6c5.pdf, the output html file was unreadable in browser. I find that all unreadable text has the same class named .ff3, which set the font-family:ff3. When I clear this style set, the text display normally. Would you please give some suggestion to help me solve it? If I open individual html page, it doesn’t show fonts correctly but if I open main html file, all looks fine. Is it possible to load individual html pages in side iframe. Also is it possible to scale the html page inside iframe, responsively? I downloaded http://soft.rubypdf.com/download/pdf2htmlex/pdf2htmlEX-0.12-win32-static-with-poppler-data.zip, unzipped it into a folder and put that folder-name in my PATH. no idea what issues you met, maybe you should give me the output html. When I convert the PDF, it converts properly. So if I open abc.html, all looks fine. But if I open page_1.html or page_2.html, output is not proper. It show first images and below that text without formatting. I checked that, main file has all the js and css files added to it. Can it be possible to add this code in all the files and run files individually? I need to create a single responsive container to hold these files. If I have converted multiple files, then is it possible to load all those files from single main file? Thanks for the help with the –data-dir switch. It seems to have created the html file, but the ‘crash’ makes it hard to use in a script. Hi. I have an example (bug?) where the html output of pdf2htmlEX renders correctly in IE and FireFox, but not in Chrome. In Chrome, it sometimes writes lines over top of each other. Look in the HTML file, pages marked vii, 22, 34, 36, 49, 59, etc. Yes, it seems this is a bug in webkit rendering engine. The ‘incoming’ branch has a fix, but not the master branch. Is it possible to compile the incoming branch for webkit browsers to display text properly. Is there a description how I can build a new windows version myself? I do get a series of warning about certain “Lookup ‘mark’ Mark Positioning” having offsets bigger than 65535, but I get those warnings for all of the files I am processing, and the results appear fine. Is there a parameter or something else that I am missing? please feel free to offer the PDF sample. does it not support the the absolute path with the input PDF file ? I tried using 0.14.6 and all the other version in windows 7(32 bit), it’s the same error. fixed, please download it again. Internal Error: Attempt to output 2147483647 into a 16-bit field. It will be truncated and the file may not be useful. Internal Error: Lookup sub table, ‘mark’ Mark Positioning in Arabic lookup 1 subtable in ‘mark’ Mark Positioning in Arabic lookup 1, contains no data. Internal Error: Lookup sub table, ‘mark’ Mark Positioning in Arabic lookup 2 subtable in ‘mark’ Mark Positioning in Arabic lookup 2, contains no data. Is this my PDF file wrong? please offer the PDF to test. I figured it out, the input pdf cannot be located in the C driver. I don’t know why. The sample pdf can be converted in the D driver ,but not in the C driver. All the parameter is the same except the input pdf file. workaround for font names in bad encodings. How does this integrate with Fontforge? Does one have to install the windows version on the PC or something? Or does it come with the downloaded zip? When I am trying to convert a pdf this is the error I am getting. Could you let me know what is wrong with it. FontForge must use an extension lookup to output it. Not all applications support extension lookups. This is the test pdf that I was trying to convert. Hm, so I built an MXE environment on an ubuntu virtual machine on vmware; can’t seem to get it to work though. How does one settle the dependencies—I don’t think the cross environment has all the dependencies needed to build pdf2htmlex right? Actually, I think the better question would be what’s the easiest way to install a package INTO mxe (for cross-compiling use, satisfying dependencies you know). I know how to cross-compile I believe, that part I think is simple, but I’m a little confused on installing extra stuff into the cross environment (making the cross environment “better/”more compatible). How do I do it? there is no an easy way to install a package into mxe, I check dependencies in a very dirty and stupid way(check dependencies from homepage). I still have no idea how to easily provide a better solution to compile it. It works pretty well, but messes up at least one page. I’ve tried numerous options, and no options, but page 49/50 gets messed up each time. Look for the phrase 1 cup balsamic vinegar, and you will see it is in the wrong place. Win 10-64. Most of this document seems to be ok – but it puts data in the wrong place. It also seems to put recipe titles in the wrong location, at the end instead of at the top. Also, it would be good to have an option to remove headers, footers, page numbers, etc. When I go from pdf to an ebook (epub), the ‘old’ page numbers are meaningless. PDF file is shared below. How do you use pdf2htmlEX on multiple files or on a folder that contains pdf files? I am able to convert single files just fine, but I obviously don’t want to run a command 100 times for 100 files. I couldn’t find anything in the documentation and something like ‘*.pdf’ doesn’t work. Hey, would you mind recompiling this with a recent version of poppler, cairo and the other libraries? I’m getting much better results on my Macbook (brew-version) and suppose it’s because the libraries are much fresher. I’m really not able to compile this myself – this is far beyond my abilities. My entire workflow is bound to a PC and the switch to my private notebook for this one step means we cannot really deploy this solution. When I tried to download ‘pdf2htmlEX-win32-0.14.6-upx-with-poppler-data.zip’, my windows 10 complained the zip file contained and stop me from downloading (Chrome). I mean the zip file contained Malware. Have you tried http://soft.rubypdf.com/download/pdf2htmlex/pdf2htmlEX-win32-0.14.6-with-poppler-data.zip, without compressed by UPX(maybe a mistake from Win10). sorry, I am some busy recently, and you can try to compile it with the help of mxe.cc. Thank you for this software, the conversions are very clean compared to others. I tried several versions of the converter, including the latest version. Also tried many different settings but didn’t have any luck. This seems likely to be a false positive but perhaps something can be done?